Orbitsound aims upmarket with Dock E30 multi-room speaker | What Hi-Fi? British company Orbitsound has revealed a more premium design while retaining the company's patented Airsound audio technology. Orbitsound has primarily concerned itself with speakers and soundbars at the affordable end of the price spectrum, with varying degrees of success. At £399 - or for a limited time for pre-orders, £319 - the new Orbitsound Dock E30 still doesn't break the budget, but it does mark a move upmarket in terms of design and features. 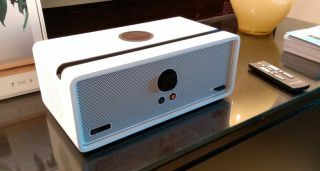 The speaker can stream audio via Wi-Fi or aptX Bluetooth, is multi-room compatible, features Spotify Connect and TuneIn internet radio, and offers USB-C and Qi wireless charging for your phone. There are aux and optical inputs, so you can connect pretty much any audio source. There's no 'dock', in the style of old style iPod docks, but there is a groove in the design that allows you to rest your phone or tablet on the speaker. Airsound, Orbitsound's audio technology, aims to give a consistent sound wherever you stand in the room, eliminating the traditional sweetspot from stereo speakers, and you can add the S4 wireless sub if you want more bass. Launched at CES 2018, the Dock E30 will be available in three finishes and is due for release in March.